MTV Reality Stars, a comedy series starring actors like Gurpreet Saini, Rajeev Varma and Simer Motiani, captures all the behind-the-scenes action of the reality television industry. 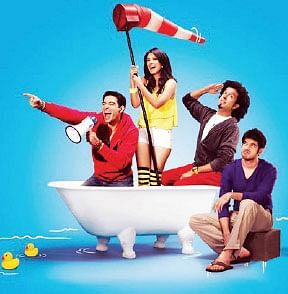 Four friends are entangled in a mess that is reality TV. Krish writes reality shows; Taniya is a reality show reject; Zameer hates reality shows; and Kuldeep is a wannabe. Tania and Krish produce a show called MTV Reject about people who have no talent. The show is a parody of every reality show. MTV, which has produced so many reality shows, is taking its own case. Yes. Reality shows are watched by everyone and cannot be ignored. When I showed my idea as a 10-minute short film to business head Aditya Swamy, he immediately agreed to it. After MTV’s Bring On the Night and Rush, what is Reality Stars’USP? Reality Stars caters to a larger demography, compared to the other two. It’s the first (full on) comedy show. Anyone who enjoys reality and friendship will love it. We had Adhir Bhat, one of the most talented writers (who is writing a movie for Be joy Nambiar and will be seen in the Indian version of 24) on our team. How long did it take to conceptualise? It took us almost a year and a half. We have treated it like a feature film.